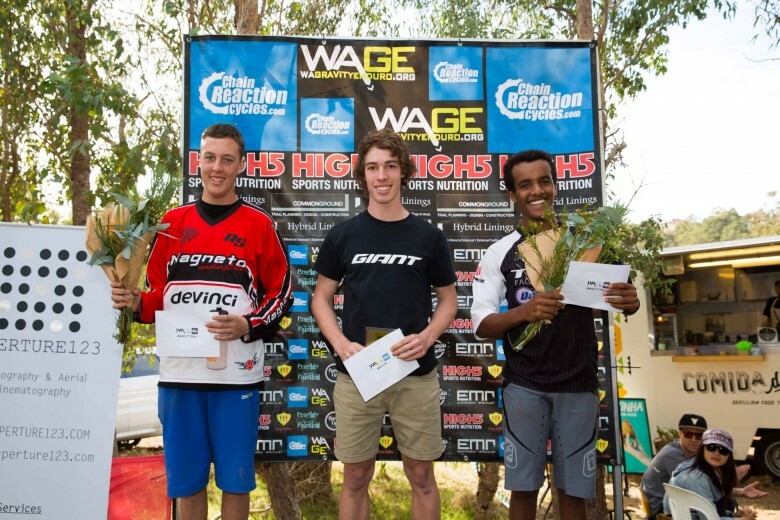 WA Gravity Enduro Round 6 Series Finale! Almost a year in the planning, the series finale round 6 of the Chain Reaction Cycles WA Gravity Enduro made its way to Balingup, Western Australia, to experience the highly anticipated trail design and construction envisioned early on by a team of volunteers lead by Devin Stafford and given the manicured touch by trail builder Paul Neve of Three Chillies Trail Design and Construction and it certainly didn’t disappoint! Monday, September 28 to Thursday, October 1 – course bunting and signage. A huge effort by Devin and his crew, we were amazed at how well the course was setout incorporated all necessary A and B lines, directional arrows and bunting…it looked a treat and I was quickly getting itchy legs from all the Facebook posts along the way! Friday, October 3 – bump in. The trusty WAGE van wasn’t going to make the distance with the huge amount of equipment needed for this round, so it was sidelined for a tougher Troopy and trailer carrying all the gear. Turning up on site, Devin, Shane, Bevan and Brydon helped setup the race village tent that became the epicentre of the weekend which was lined with black plastic to help reduce any glare for the setup of the plasma TV for the AFL Grand Final showing on Saturday. After a fight with the gusty conditions, it was time for a trail walk to finalise bunting, signage, start and finish gates and thankfully to get a few test runs in! With sunlight diminishing, it was time to setup the satellite system and test the reception – 30minutes later and we were in business with HD satellite reception! Mounting the plasma was delicately done in the back of the Troopy and with the stage set, we were good to go for the AFL show… or so we thought… with winds packing a huge punch tearing the marquee and ripping out guide ropes, it became a long night into the early hours holding down the tent. With huge thanks to Matt, Joel and Neilson, we somehow survived the night and got to sleep with one eye open watching the tent sway a few metres at a time and still expected to fish it out of the dam in the morning. With St John Ambulance on-site from 11am, the practice session saw fair conditions but the gusty winds didn’t disappear which made for an eventful practice session. With competitors arriving on site to pick the best camping spots, others decided to park their car, suit up and jump on the waiting shuttles for a lift to the trail head. Special thanks to Brydon and Jess for operating these shuttles for most of the day, which saw at least 120 competitors head up the hill and check out the amazing 5 stage enduro course that was on offer. With some of Paul Neve’s finest work on location, metre high berms running faster than footpaths railed riders into perfectly sculptured gap jumps, table tops and rocky sections through Pine and Bluegum plantations before spilling into open fields and again disappearing into natural vegetation. 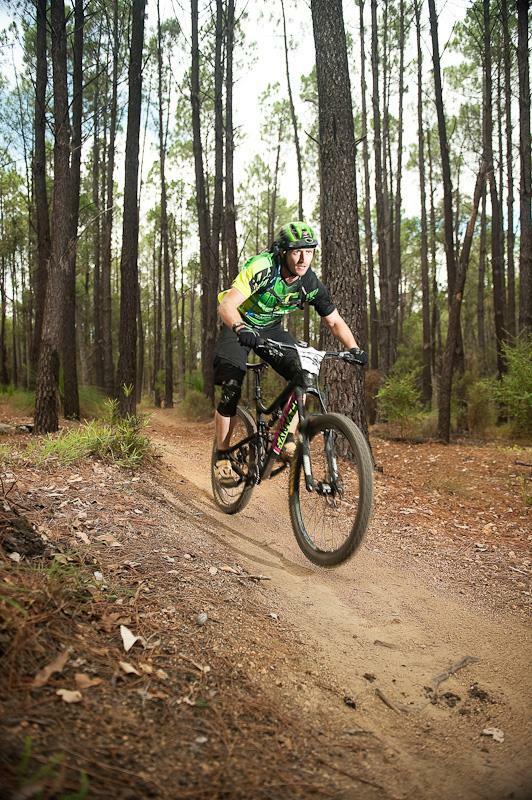 The trails encompassed so many different elements that it is now regarded as arguably the best trails in Western Australia! A spectacular 4 jump sequence which was reminiscent of some of the worlds best bike parks, with riders seen whipping and seat grabbing and enjoying the amazingly comfortable jumps… that is until gusty conditions across the open field caused a few crashes and a broken collarbone for young Ryan who was very excited about bending his bars in the accident. Special thanks to Morgan and Matt who were on the scene very quickly and got the word back to the village that medical assistance was required. Some tough decisions then needed to be made on whether to close this exposed section of trail and later in the day after a weather check, it was decided that it was safest to leave these jumps out of the race which was the right decision considering the gusty conditions experience during the race on Sunday. With the weather calming on Saturday night, the atmosphere in the camping area was electric and it was great to see the mountain bike community having a great time from the juniors, to families, single participants and seniors… well done to all for the energetic but respectful camping that took place. Prior to race briefing scheduled for 1030, over 200 competitors made the most of the calm conditions to get a last look at the 5 stage enduro course and get warm for the event. Shuttles in the waiting, riders were quickly whisked up the hill with the Elite Male and Elite Female hitting the course in its designated order giving them a clear run to post some very impressive times. Stage 1 – Valley of Dreams. What a way to start the day’s race for the Elite field… not far out of the gate, you are welcomed by WA’s finest pea gravel before shaking your teeth over a man-made rock section before bombing down through off camber trails, whizzing alongside large vertical drops before heading in and out an open field quicker than you can say ‘fullface.’ A demanding first stage and certainly one that got you warm (or hot and sweaty). The stage had an average time of 00:03:59 with Deon BAKER, Jordan PROCHYRA and Blake PEARCE equalling the fastest time of this stage with 00:03:05. Stage 2 – Edge of the World. For most riders, it was a matter of ‘how much brake should I release?’ Demanding your full attention, this raw stage saw competitors really digging into corners to find the ruts caused by competitors and the quicker rider certainly made the most of these features, with more twists and turns than a 50’s barn dance. An average stage time of 00:03:20 was slow compared with Ryan LITTERICK squeezing in the fastest stage time with a 00:02:26! Stage 3 – Huggies B. Designed by Sam Hill, we knew ‘Huggies’ was not going to be your average enduro course – in fact, it wasn’t even your average downhill course. If you had to find a way to get from the top of the hill to the bottom in the least amount of time while taking in every boulder, rocky outcrop and technical feature along the way, this was it. Hence, the birth of Huggies B! Still quite a raw trail through Bluegums, it was quite similiar to Stage 2 in terms of terrain and ‘rawness’ with both stages quite short and technical. The average descent time was 00:02:09 with Deon BAKER clocking in at 00:01:57. Stage 4 – Mr Enduro. If ‘Gravity Enduro’ was in the dictionary, a few photos from this trail would be the definition. Riders were spoiled with multiple gap jumps at the top end of the course before a long demanding descent taking in a myriad of berms, off camber sections, various vegetation types, flat to fast to twist and turn, this trail had everything! The average time of 00:07:01 saw Jordan PROCHYRA clock the fastest time of 00:05:09, clear of anyone by 4 seconds. Stage 5 – Boxers Blast. Perhaps one of the most exhilarating stages, the final finished right in front of race village and was certainly one for the photographers. Again, spoiled with multiple double jumps up top, riders could chose to link together by jumping, rolling or pumping rolling doubles which made for some great fun for the riders before exiting the trees into the open field and having a ‘blast’ on some 50m long berms that left riders wanting more! An average stage length of 00:04:10 saw Sam RUBERY take the stage win at 00:03:18 and was the clear of anyone close by a massive 7 seconds. The overall average time was 00:21:09 and Deon BAKER posted the quickest overall time of the day with 00:16:07. Click here for the round 6 results in full detail. Chain Reaction Cycles, High 5 Sports Nutrition, Hybrid Linings (Quality Internal / External Ceilings and Walls), Common Ground Trail Planning Design Construction, Rock n Roll Mountain Biking, Foothills Cycles, EMR Suspension Specialist, Prodigy Painting, Three Chillies Trail Design and Construction, IGA Beeliar, Lions Club, New Town Toyota and Kalamunda Toyota and Bootleg Brewery. The Eaton Family and the Stafford Family including Devin, Kevin, Bevan, Mark, Brydon, Boxer, Jess, Jo, Amy, Russ, Paulette, Joclyn, Steve, Andy, Trent, Terry, Peter, Johnno, Brian, Carolyn, Matt, Neilson and Joel, and to everyone who just chipping in any little way…it is very humbling to have so many people simply wanting to help any way they can. Finally, thanks once again to our major sponsor Chain Reaction Cycles for their support throughout 2015, and we look forward to a big 2016! Till then, enjoy the Christmas break and I hope santa fills your sacks with CRC enduro goodies! 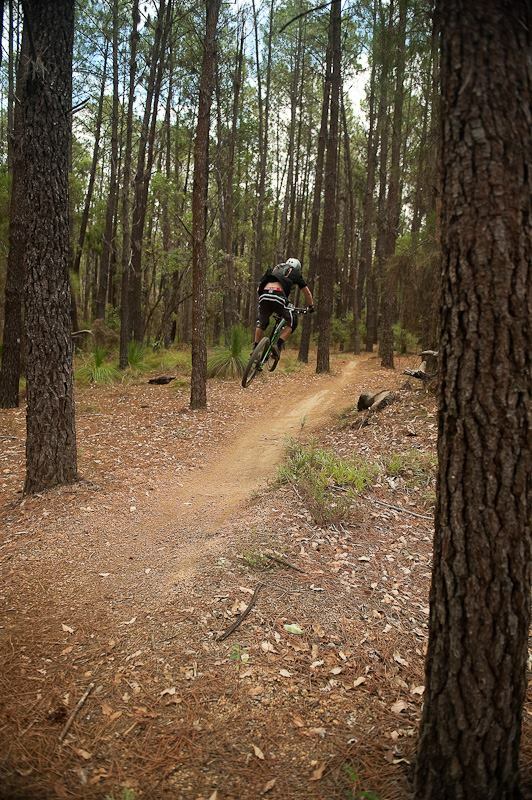 WA Gravity Enduro Round 5 – Perfect Pines! An incredible turnout for a massive weekend of mountain biking! 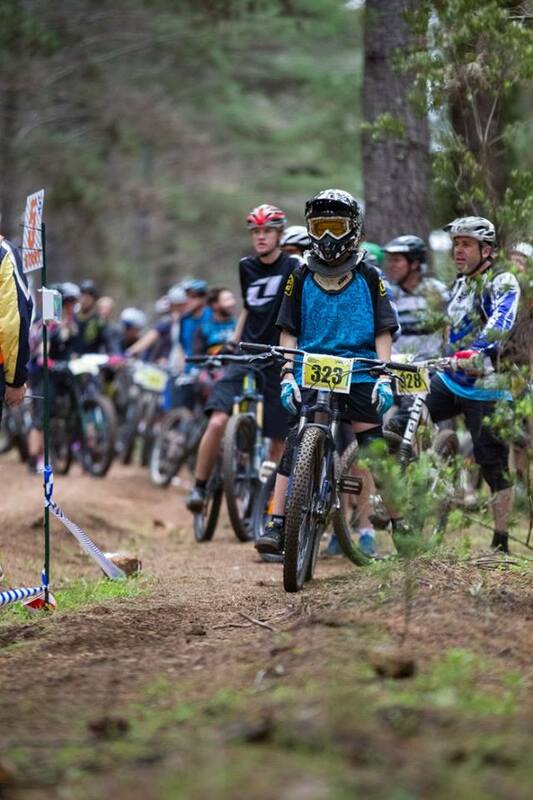 With perfect cool racing conditions, The Pines in Margaret River hosted the State XC Championships on Saturday and WA Gravity Enduro Round 5 on Sunday. A great turnout on both days, with WAGE hosting 200 competitors and over 100 spectators on Sunday in a 5 Stage Gravity Enduro race format. With access limitations caused by recent logging, we were privileged to be able to race in The Pines thanks to Forrest Products Commission (FPC) and the Department of Parks and Wildlife, who were amazing in working with us to allow the event to proceed….they even called us Saturday morning to let us know The Pines were officially re-open! The Pines are renowned for short but intense descents and this was played upon in the stage setup. Due to the course shortness, we introduced a slightly revised format, where stages could be completed multiple times in any order where a competitors fastest stage time was used in a 2.5hr overall time limit. This was very well received and made for some interesting and exciting racing. However, Margaret River isn’t just about mountain bike racing – with excellent accommodation and local tourist attractions, it makes a great excuse to get away for the weekend with family and friends and experience the amazing countryside in the south west and enjoy all the top quality food and wine in the area. Stage 1 was a great warm up for competitors. Dropping into the trail from Wharncliffe Mill, competitors pedalled hard through the top flow section before some tight bends and rocky sections in the mid-section followed quickly by getting back on the gas, tucking in and pedalling hard to the tight-right at the finish to ensure competitors didn’t end up in a loungeroom at the Riverglen Chalets. The average time for this stage was 00:01:53 with Dave Nairn and Sam Rubery equalling the quickest time of 00:01:32. Sam Rubery taking the win in Male U19, and the fastest for the day! Stage 2 is a new trail and was a lot of fun. Tight off camber switchbacks with some challenging log-overs meant this stage which averaged 00:03:43 which saw competitors pull up hard under brakes to tag-off without having a chance to test the strength of the park bench alongside some sketchy pea-gravel! 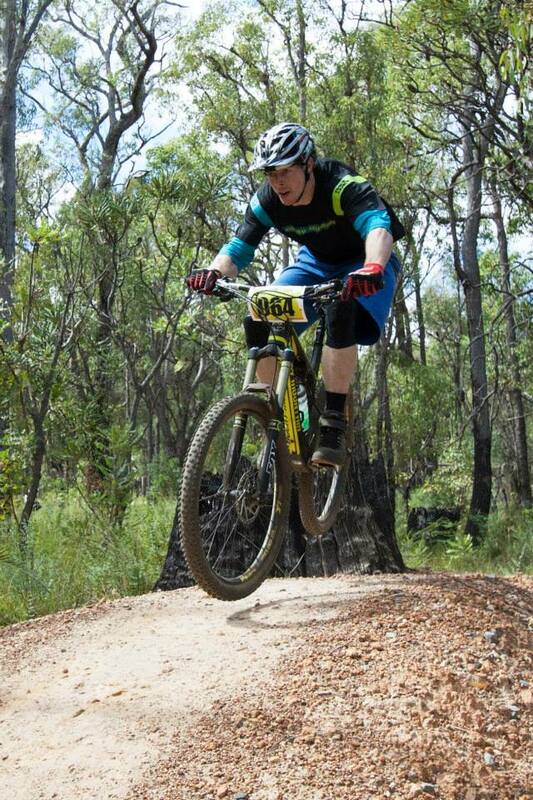 Sam Rubery posted the fastest time for this stage with a blistering 00:02:29 – clear by 7seconds! Stage 3 could have been considered the highlight stage of the day, and is of-course known as Big Pine. A flat section at the start saw competitors pump some jumps, before dropping into Big Pine. Take the log-ride or take it wide…a close choice and hot-topic of what really was the faster line? 00:03:31 was the average time for Stage 3 and again, Sam Rubery showing us all how its done by 5 seconds with a time of 00:02:52. Stage 4 saw the introduction of ‘Hoodies’ into this years race. Flatter up the top before again dropping into a short and sweet descent before tagging off. 00:01:56 was the average time for this stage, with Sam Rubery posting the fastest time of 00:01:33 – clear by 3 seconds. And Stage 5, on average, the shortest stage but arguably the hardest for an enduro rider. A flat fire-road sprint saw some heckling from queuing competitors before dropping into Managers. Adam Fountain was the unlucky competitor whose middle finger decided it didn’t want to be straight anymore, but the St John Officers decided otherwise and a short trip to hospital saw Adam return to the village after the race enjoying a cold one! With an average time of 00:01:23, Male Elite winner Jordan Prochyra took the top spot for this stage with 00:01:07 by 2 seconds, with Sam hot on his pedals! The Wharncliffe Mill was the epicentre of the weekends racing, and Adrian and the team did an amazing job in keeping the area in pristine condition and allowed us to use all facilities in the area. When you are back in Margaret River, head to the Wharncliffe Mill and thank Adrian for his hospitality! With trails literally on your doorstep, its a great place to stay! Well done to all competitors and podium placers and a huge thanks to MRORCA for assisting with the day’s racing and providing volunteers to marshal. 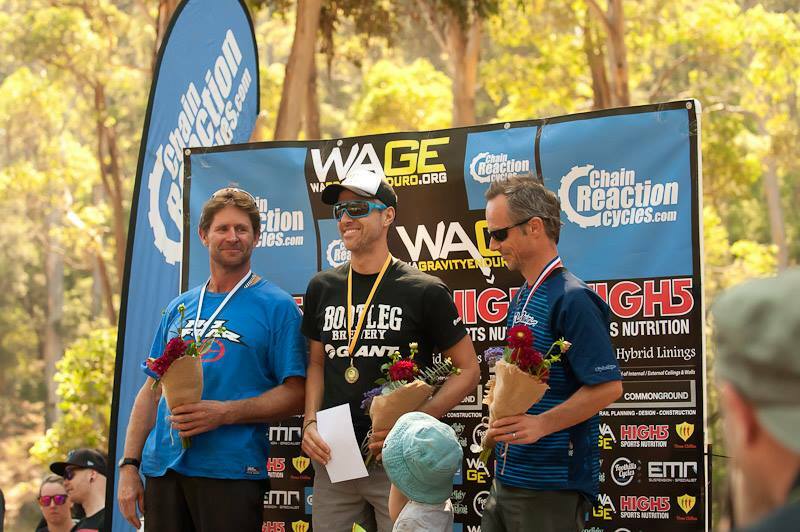 WA Gravity Enduro is proud to donate $400 to the Margaret River Off-Road Cycling Club (MRORCA). We look forward to another Dirty Weekend! 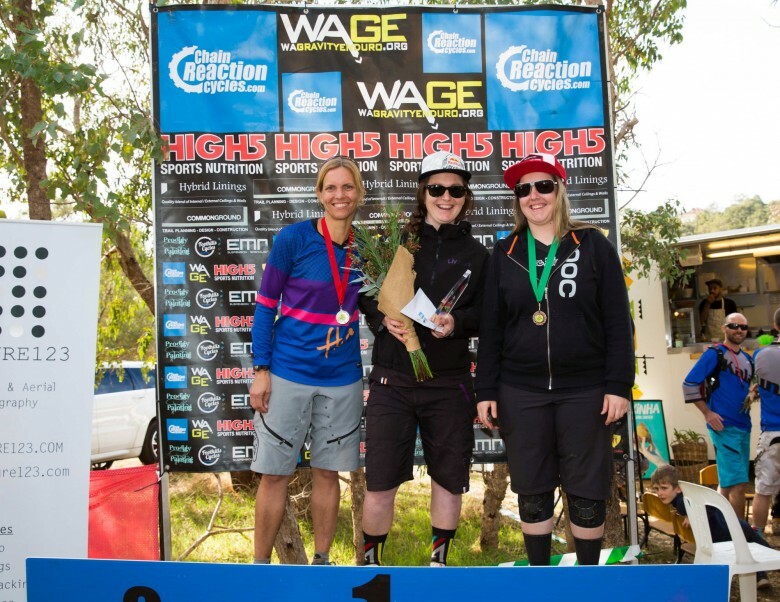 WA Gravity Enduro loves to see more women in mountain biking, and we believe Margaret River was our biggest female contingent! Congratulations to all these competitors for coming out and having some fun! Female Masters 50+ winner Kris METCHER scaring off the competition! and a personal thanks once again to our volunteers on the day: Trent, Steph, Peter, Jason, Reece and Kyra! DONT FORGET TO REGISTER FOR THE FINAL ROUND OF 2015! Balingup is sure to bring you back in 2016, with Saturday practice, camping and Sunday’s race, this will be another epic weekend that you need to write in the calendar! As usual, registrations close midnight Tuesday. Don’t forget to check here to confirm your race plate BEFORE registering.If you have already raced with us, this is your ID to enter! BRING – wristband (all to be handed in) and raceplate! 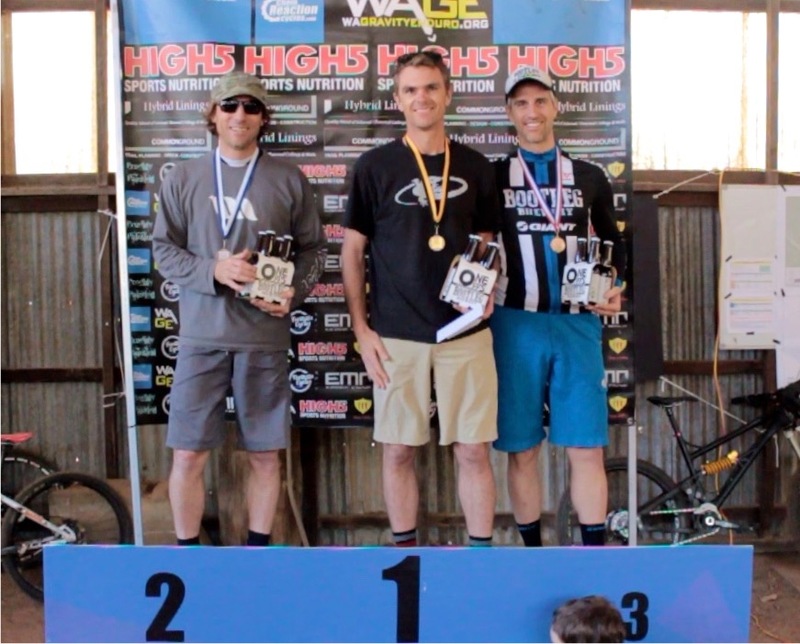 With the Australian sun beaming down on 200 spectators and almost as many competitors, conditions could not have been better at the Goat Farm Mountain Bike Park in the ‘wilds’ of Western Australia. 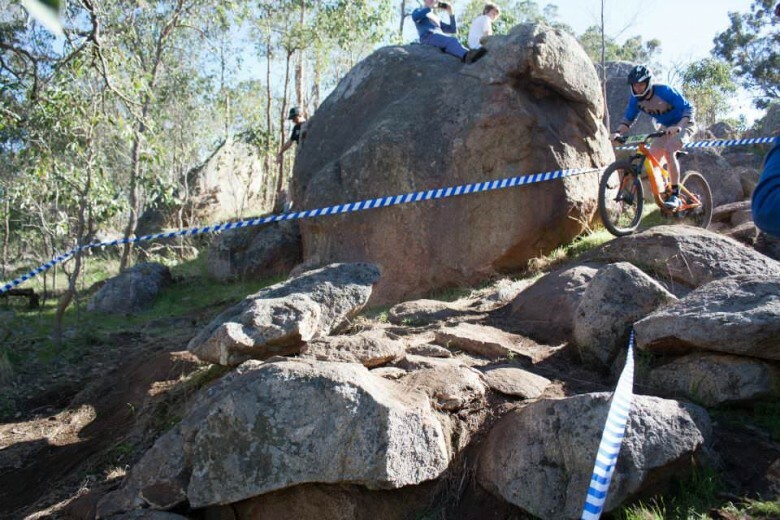 Living up to its reputation as a Mountain Biking destination, as WA Gravity Enduro hosted round 4 of the MTBA National Gravity Enduro Series. 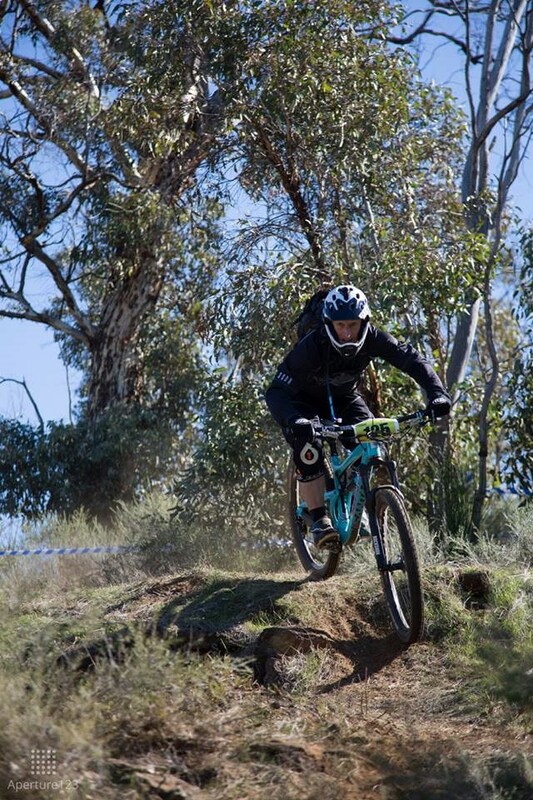 The Goat Farm Mountain Bike Park, Western Australia is one of the closest mountain bike trail areas to the Perth International Airport, which made access quick and easy for the interstate riders taking part. Conditions could not have been better in the lead up to the weekend, being a sunny Autumn day with a top of 20°C for both Saturday’s afternoon practise session and racing on Sunday. 180 competitors and 200 spectators ensured they day was filled with exciting competition and a great cheer squad! Devin Stafford was the man of the hour, powering home to victory. After months of planning, design, testing and building of the course, rock gardens were a prevalent feature, testing riders’ choice of A and B lines, plus a trucked-in slopestyle jump, raw off-camber turns, smooth and fast sections incorporating jumps and steep berms, plus a 4x track which spectators and riders lapped up sitting in the trackside licensed area. WA Gravity Enduro incorporated 5 stages into the National Gravity Enduro race, and each stage had a unique mix of the infamous ‘ball-bearing’ pea gravel, hard compacted soil, and huge granite boulders all taking place in a dedicated mountain bike area. 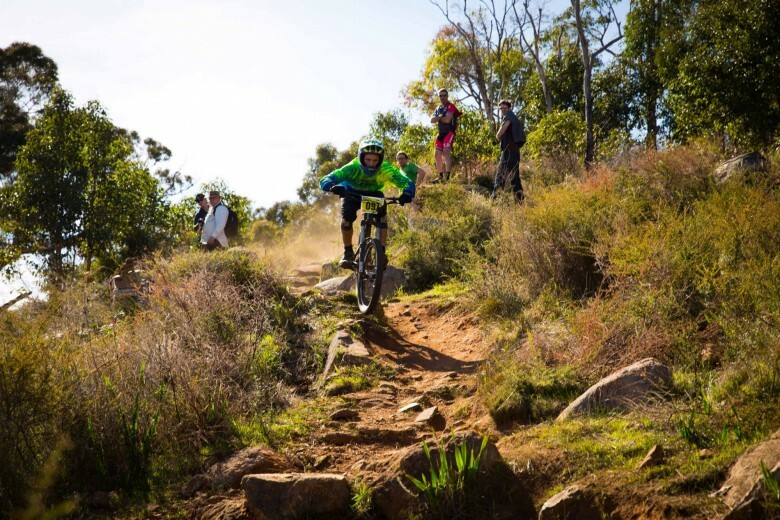 WA suits the gravity enduro format extremely well, as the shorter elevation means multiple stages can come in close proximity to the race village which makes for exciting spectator opportunities and a lively atmosphere. 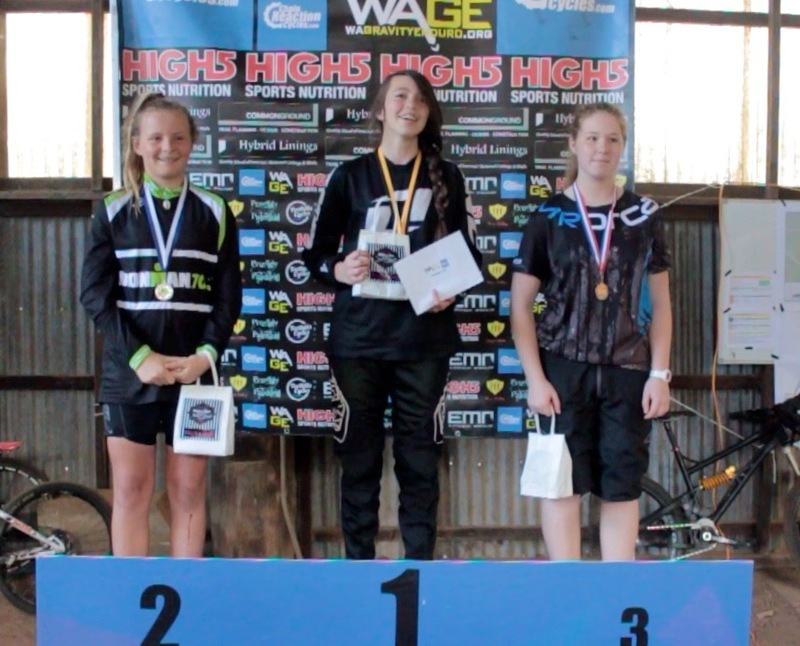 The local riders didn’t disappoint, with the likes of Jimmy Pritchard, Jordan Prochyra, Devin Stafford, Sam Rubery, Holly Baarspul, Claire Garcia-Webb and Penny Holmberg ensuring WA firmly applied a strong presence and tough competition in the 180 competitor field. After closing Stage 1 due to the extraction of an injured rider (who is now recovering well), time limited the racing to 4 stages. The fastest rider of the day was Christopher Panozzo from Victoria clocking in 9mins and 5 secs, closely followed by local under 19 champion Sam Rubery with 9min 14secs, with Jaclyn Shapel clocking up 11min 47s for the Elite Female with local speedster Penny Holmberg only 55 seconds behind. 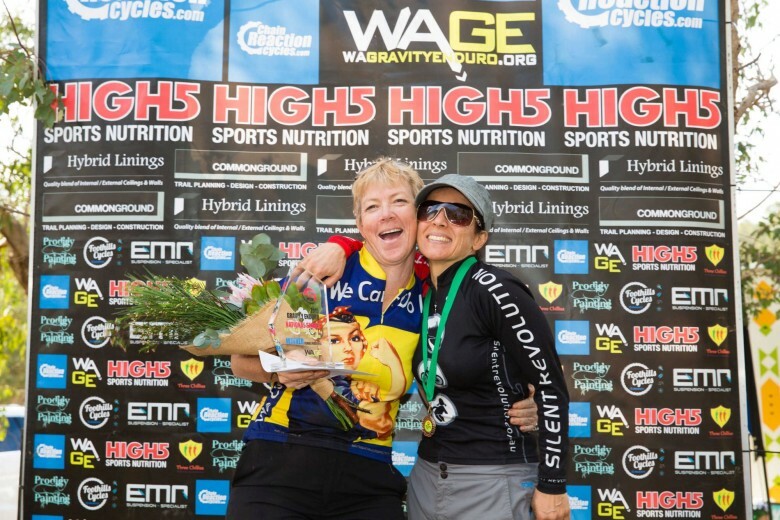 “Big thanks to WAGE for putting on a fun event, the stages were great, you could really throw the bike around and push with plenty of fast turns and off camber, if only more races were like this!” Chris Panozzo said. Female Elites, Jaclyn Shapel,Penny Holmberg and Holly Baarspul. Female Master 30’s, Kyra Eddy, Jayne Richards (not present) and Vilma Fitzgerald. 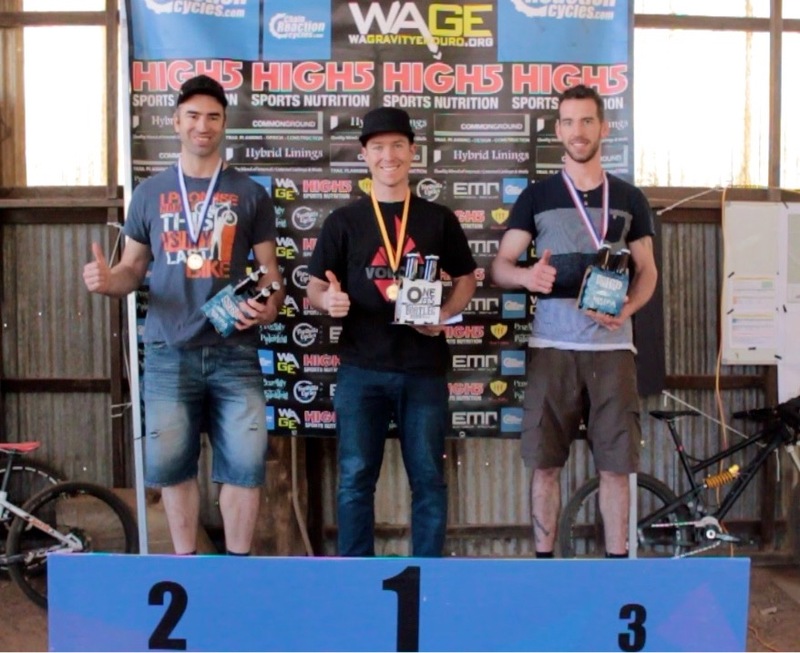 Results were held for both the WA Gravity Enduro Series and the MTBA National Gravity Enduro Series, which made for interesting comparisons between the local and interstate riders, and its safe to say that sandgropers can ride, and ride well! 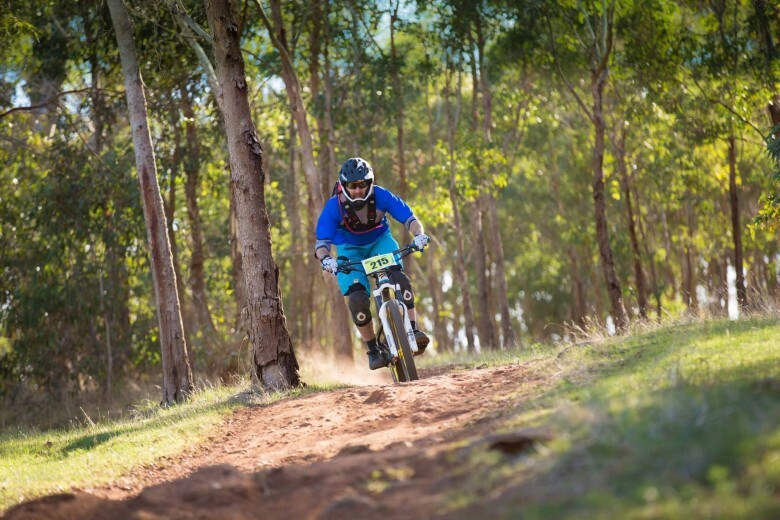 WA Gravity Enduro Round 3 – Golden Grove goodness! What an absolute ripper of a weekend! 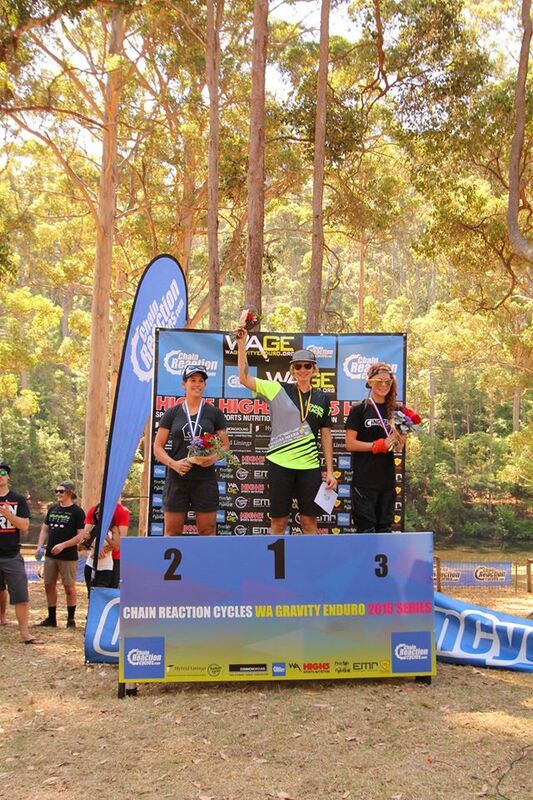 9km’s of course bunting, 3 intense enduro stages, 180 competitors, a shed load of oranges, slope-style jumping, a magical Autumn’s day and fun, competitive mountain bike racing were the ingredients for a huge Round 3 of the CHAIN REACTION CYCLES WA Gravity Enduro Series 2015. It took a scrum of volunteers to tackle the trails with work first beginning 4 days out from the race with the ‘godfather’ Paul Neve of Three Chillies Trail Design and Construction marking out the trails at Golden Grove Orchard in Chittering, about 1 hour out from Perth, Western Australia. 3 days out from the race, the trails were further dialled in and checked it adhered to the enduro format, ensuring 80% descent and 20% ascent/flat guidelineswere maintained. With 2 days to go, Stage 2 was the focus with the construction of a huge slope-style jump as a unique way to cross a fence boundary, which turned into a bit of a whip-fest on raceday. The rest of the day was filled with trail bunting which saw the team of Phil, Paul, Jimmy and Vlad work until sunset when the well-deserved lemonades were opened. With 1 day to go, all hands were on deck to bunt Stages 1 and 3, and a well-oiled team of Steve, Phil, Jimmy, Rich, Rikkie, Ryno, Ross and Paul finished off the 6km of course bunting. By 1pm, the course was open for inspection with strict rules on walking only and no course riding were in place. This allowed all riders to be on the same playing field come raceday, and this format was very well received. On Saturday afternoon, the race village was getting prepared for an early start on Sunday. Raceday. With riders very keen to get their tyres dirty and test out their lines, it left most riders about 3 hours to get a feel for the trails and memorise as many things as possible. Come 11am, the race briefing began at the village, and then the field was split into 3 groups, with each group heading to a different Stage. 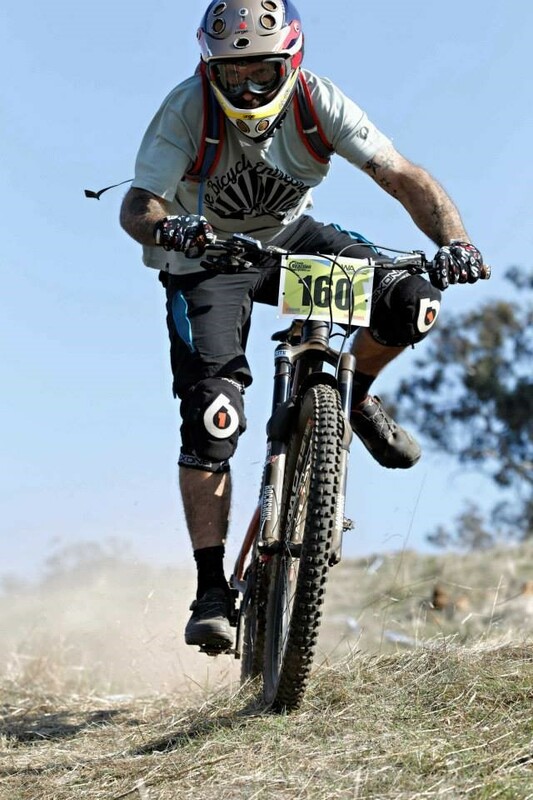 This is WA Gravity Enduro’s usual format as it helps riders get through the stages in a timely manner which allows us to present results quickly after the race once all riders are accounted for. Stage 1 saw the Male Elite riders first as they pedalled through the trees at the top of the hill, and then broke out in the open field filled with rock drops and jumps, before they disappeared into an orange orchard maze. The orchard was great to watch, as riders had to keep their eyes up to see the course bunting, but at the same time, keep their heads down as they received orange braches to the face. A little of 3 minutes of intense racing for the Elite racers, Stage 1 finished in the orchard and riders then transitioned up the hill on the other side of the valley to tackle Stage 2. After a 30-40min climb for most, riders were understandably quite happy to have a rest and take in the rolling panoramic views from the top of the hill. Once riders tagged-on, a longer flat section at the top soon dropped away for riders to generate speed into the slope-style jump to clear a boundary fence which quickly flowed into some steeper switchback descending. As the riders exited the trees into another open field, the sheep in the paddock were very well behaved and kept clear of the course and didn’t eat any bunting, so big thanks to them. Riders then flew down another fast section, scrubbing a small mound in the terrain, blasting through a rocky section, and flying down a short fireroad buzzing orange trees, before a quick right to tag off in a little over 4 minutes for the elite riders. Passing back through the race village on their way to Stage 3, riders replenished with some much needed HIGH5 SPORTS NUTRITION to give them the strength to push back up the same hill as Stage 1. Tagging on at Stage 3, riders made short work dodging trees before heading back out into the open paddock where wide bunting allowed riders to choose their own adventure – either the quicker but more difficult A line or the slower but easier B line. These features were perfect for spectators to cheer on the competitors, which was heard all the way back down at the village! The riders had to negotiate some steep switchbacks, rock drops and pinch climbs before setting themselves up to drop into a mad 22% decline fireroad before flattening out over the 300m to really test the nerves and the brake fingers! A quick left to tag off at the race village saw riders exhausted but thrilled, before they headed over to their free lunch! Wooo! Once all riders were accounted for, presentations shortly followed and with plenty of flat tyres, spills and new trails on offer, it saw an interesting change in the results. In the Male Elite, we had a tie for third place and on a countback between Jimmy Pritchard and Carl Pickersgill, it saw Carl take the place. Bill Carruthers for Male U19. Devin Stafford controlling the Male 40-49 category by 27 seconds. Penny Holmberg in a commanding 1st place for the Female Mssters 40-49 and clear of seconds place by 1min 47sec. Terrific friendly competition with Claire Garcia-Webb winning the Female Elite 19-39 Category by a comfortable 16 seconds. Congratulations to all competitors that took part in the fun, and special thanks to Paul Neve of Three Chillies Trail Design and Construction, Rocco and the team at Golden Grove Orchard, and to all the Mum’s who let their husbands, son’s and daughters take part on Mother’s Day and to the Mum’s who thought the best way to celebrate the day is to come out and race! Huge thanks once again to the volunteers as this race would not happen, would not be safe or well organised without them – Phil, Paul, Vlad, Jimmy, Rich, Ryno, Ross, Rikkie, Amy, Russ, Trent, Terry, Peter, Stephan, Chall, Riley and Rene. 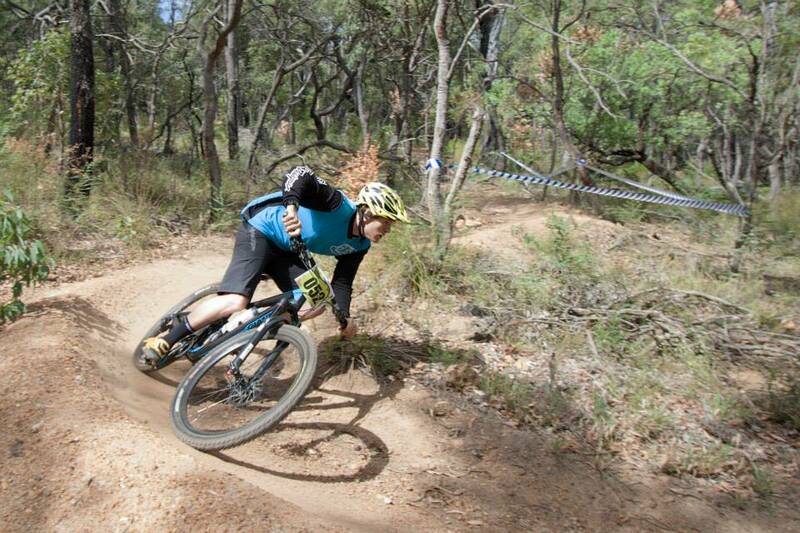 1st time racer Orion Daley-Coers manualing through the rough after spending the Saturday bunting. Huge thanks also to our sponsors and supporters: CHAIN REACTION CYCLES, HIGH5 Sports Nutrition, Hybrid Linings (Quality Internal / External Ceilings and Walls), Common Ground Trail Planning Design Construction, Rock n Roll Mountain Biking, Foothills Cycles / Jet Cycles Kelmscott, EMR Suspension Specialist, Prodigy Painting, Three Chillies Trail Design and Construction, IGA Beeliar and Petal Parcels for organising the beautiful flowers and keeping the riders out of trouble with some WA Gravity Enduro special Mother’s Day Gift Packs! Full results available here, and we look forward to compiling the course video in the coming weeks. The next race in Round 4 on June 14th at the Goat Farm, Greenmount, which is also a part of the MTBA Enduro National Series. Head to www.wagravityenduro.org or find us on Facebook for further updates. 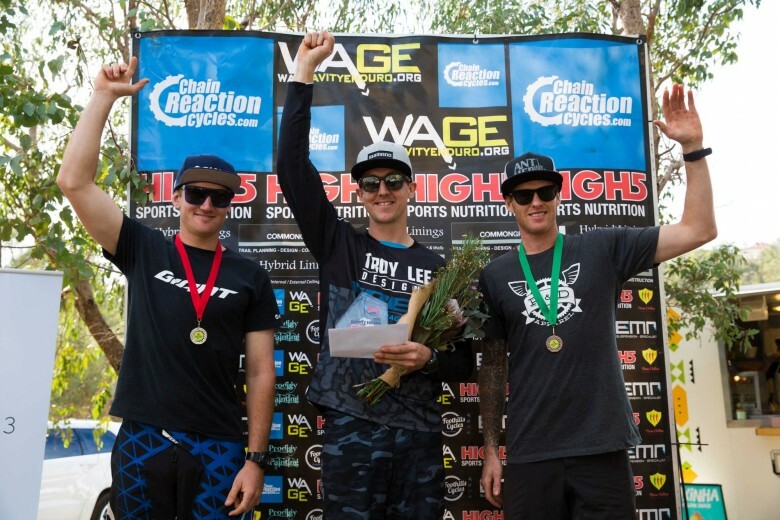 Round 2 of the CRC WA Gravity Enduro series saw the popular trails of Kalamunda testing skills and endurance in perfect riding conditions. With the race village situated at the Calamunda Camel Farm, the course was different to last year’s national round with no Mt Gunjin trails used, but plenty of old favourites thrown into the mix. With the race being capped at 200 riders to ease waiting time, entries were sold out quickly showing the series is a hot ticket amongst riders. Riders were once again split into two groups with ‘A’ group doing stages 4,5,1,2,3 and ‘B’ group doing 1,2,3,4,5. Stage 1 saw riders leave the race village and head to lower half Camikazi. Riders were met with pedally rocky sections and little kicker jumps most of the way down with a few tight sections and once at the bottom, riders had to make a tight left and fly down the fire road with a nice sweeping right hander with a choice of a loose inside line or outside rut where racers could rail like berm and carry speed to the tag off. Who touched their brakes? Stage 2 was the short and sweet Lancaster, a fairly easy descent with jumps and ladder hucks, with some guys carrying their speed to the point where they would just gap the whole ladder! At the tag off some riders were surprised at how buggered they were from such a short but intense stage. Riders then had to ride up ‘Lube Me Up’ to stage 3 where they were met by Tyler Fletcher (a young champion who couldn’t race because of injury so he stepped up and marshalled…legend in our books!). Stage 3 was down Scorpion with its iconic rail sleeper berms all the way down to the road crossing into the Pines where riders hit warp speed and boosting the kicker, carrying speed into the blown out left corner before tagging off. After stage 3, riders were faced with the longest transition riding a combination of trails that made their way up to the top of Mt Gunjin. Once here riders took the chance to take breather and reset themselves for stage 4, which was part of last year’s national round with a slightly different start. The start was set on the side of Gunjin road so riders could pin it straight into the loose corner that leads into the old staircase trail, a few riders being caught out on the corner and not sure on what line to take on this short fast descent compared to some of the experienced riders who revelled in this oldschool section. From here riders had to make a sharp right into 3 Bears, carry speed across the powerlines and into the long pedally Mercury St. Stage 5 started after another slog up to Mt Gunjin. Stage 5 started at the entry in to Goldilocks which is a fast descent with a heaps of berms – from here riders took the big left berm into Muffin Tops navigating through a few rocky sections into tight flat right hander. From here riders could open it up and pin it all the way down over tabletops and kickers to the tag off which was situated just before the trail started to meander up slightly. Phil, Claire, Terry, Trent, Sam, Rich, Rikkie, Tyler, Peter, Stephan, Cyril, Sabrina, Russell and Amy, and special thanks again to the Calamunda Camel Farm and the Kalamunda Mountain Bike Collective. 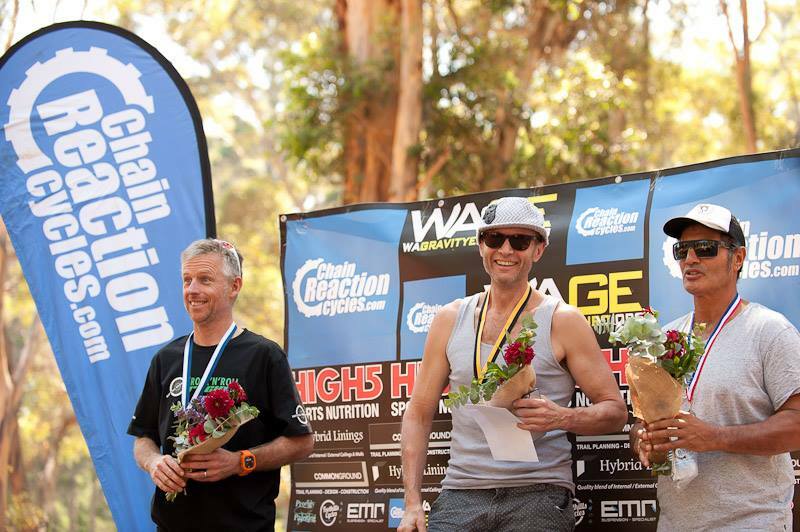 Lindsay Alsop of the Kalamunda Mountain Bike Collective accepting the cheque from WA Gravity Enduro for $900! Once again, we are pleased to donate 10% of your rider entry back to the course, to assist with sustainable racing and trails! The next round is on the 10th of May at Golden Grove in Chittering. Series sponsor Three Chillies is planning the course with input from volunteers with XC and DH backgrounds. This is a private course with some exciting descents, with plenty of new surprises thrown in for the regulars. Get excited ladies and gents as this round is going to go off like a firecracker on new years!!! 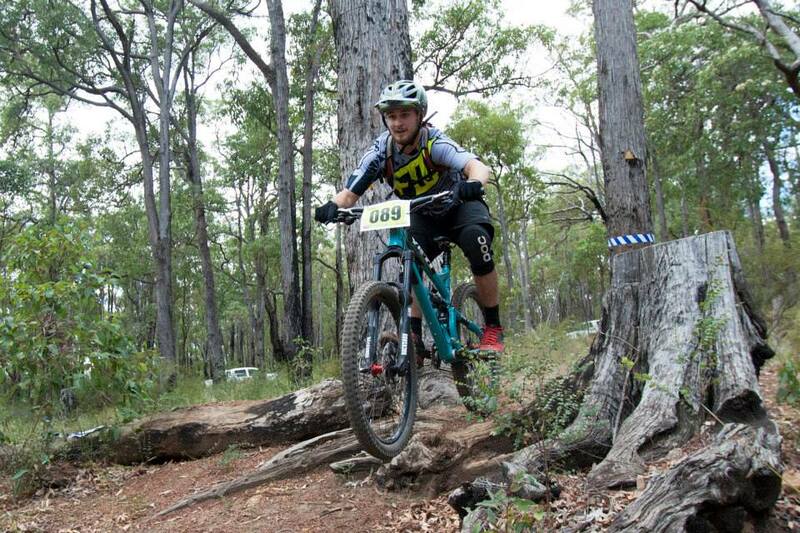 Pemberton MTB Park played host to round 1 of the 2015 Chain Reaction Cycles WA Gravity Enduro series. Master trail builder and legend Paul Neve came up with a course that challenged everyone from downhillers to cross county riders to the weekend warriors, putting everyone in the hurt locker on sections and challenging riders on descents. With 170+ racers registered the field got split into two, with 1 group doing stages 1 to 6 and the other group starting on the Pump Hill trails riding the stages from 3,4,5,1,2,6. Stage 1 was down “Bloody Mary” a riders’ favourite and the one of the most challenging. With a lot of berms and jumps throughout. One of the best sections being after the fire road drop in, with Tom Anticich gapping into the third berm from the chute, unfortunately with it not paying off and him returning to stage 2 covered in dirt. After the bottom jump line riders had to carry their speed into a short speed into short pinch climb which linked into “Just Because” and then one more short pinch to the tag off. Stage 2 ran down “Pirate Trail” a hand cut trail which showed wear and tear in parts from the national XC round from a few weeks ago. With a tight switchback pinch halfway down riders started to tire before descending into a series of rocks and logs and then onto a fast fire road section in to hip jump. Riders had to carry speed into a hard climb that had most riders cursing Nevesy’s track layout before the tag off. From here riders rode across the bridge and up the Rainbow trail to Pump Hill. Stage 3 was a return of “Pump Hill Uphill” an up track in reverse, unlike last year the track was bedded in and running superfast. Stage 4 was another new one this year “Longshanks” which is a favourite of Sam Hill, with loose leaf litter on track riders had hold their lines leading into corners that developed moto ruts as the wore one. This trail hard on the legs especially over the old rail sleepers section. 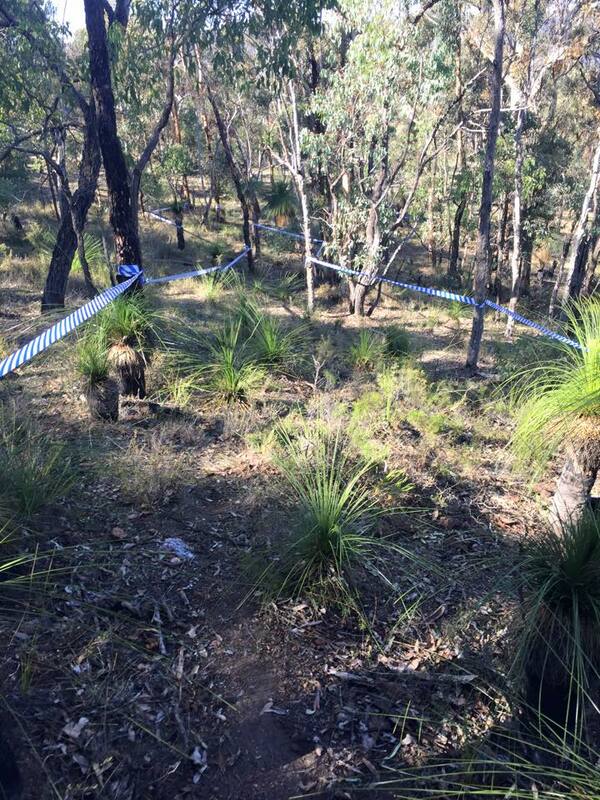 The next trail was the brand spanking new “Dropbear” which only opened on the Friday before the race, not 100% complete Nevesy signed off on it and riders rode it all Saturday to bed it in. with ruts in majority of corners it became a favourite of the racers. The final stage saw riders make it up to the main hill to ride down a combo of trails. Starting of down “Relentless Blue” with its famous timber berms and then linking across “Cool Runnings” with its flowy goodness once riders got in to rhythm and loving life as the end was near they were sent across the hill to “Black’n’Blue” with its torturous undulating trail, riders had to dig deep as the end was in sight all they had to was fit the handle bars through the walking bridge and then tagging off right by the pool. Riders were given fruit and sandwich donated by IGA. After the race riders enjoyed a swim in the pool and some hydration whilst the final riders concluded proceedings. With everyone smiling about the race and chatting to mates and riders who haven’t raced in recent years. 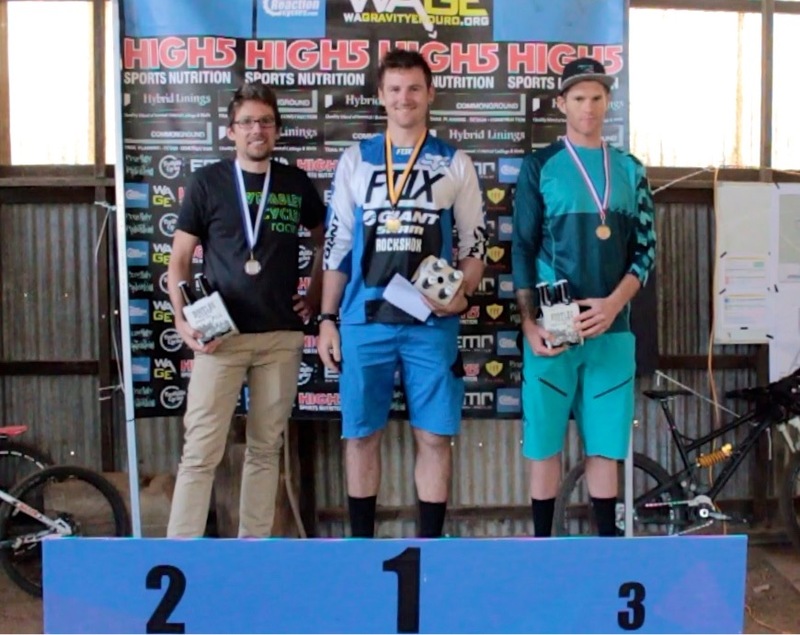 Its also great to see so many from the local bike industry racing with Wembley Cycles, Kalamunda Cycles, Speedlite Cycles well represented and of course Foothills Cycles who had few lads race as well as supplying a pit area and selling stock. It must also be said that there were riders from all over the state – Karratha up North to Albany in the South and a strong contingent throughout the south west. After running clinics for two days before race, Clare Buchar steaming in to take the win in women’s elite. Male U19 Winners. 1st Sam Rubery, 2nd Bill Carruthers, 3rd Blake Pearce. Photo: Mark Hudson. Male U15 Winners. 1st Roly Kyme, 2nd Jesse Morgan, 3rd Cadel Adams. Photo: Matthew Farrell. Male Masters 40-49 Winners: 1st Michael Kerklaan, 2nd Chris Hisckson, 3rd Lindsay Alsop. Photo: Matthew Farrell. Male Masters 50+ Winners: 1st Rick Twine, 2nd Peter Millard, 3rd Merv Joyce. Photo: Matthew Farrell. 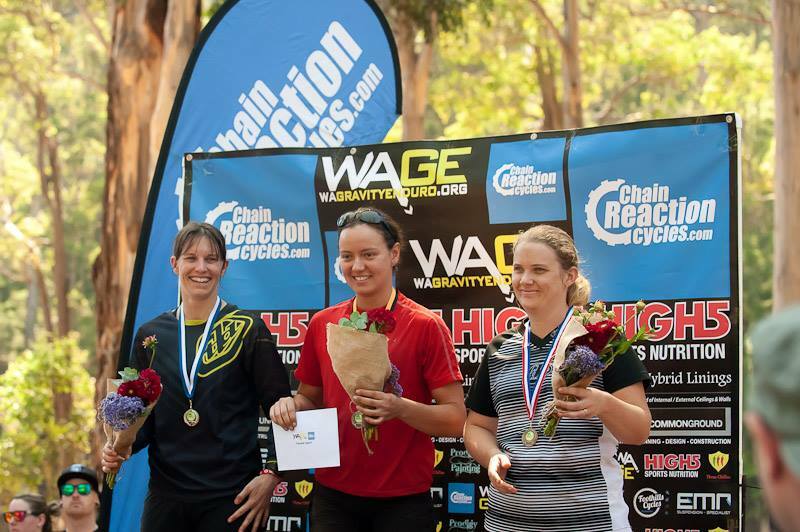 Female Sport (19-39) Winners: 1st Ingrid Fuhrmann, 2ndLeonie Burford, 3rd Natalie Pearson. Photo: Matthew Farrell. Female Masters (40-49) Winners: 1st Penny Holmberg, 2nd Carolyn Ryan. Photo: Matthew Farrell. Kovarik Racing Weekend! 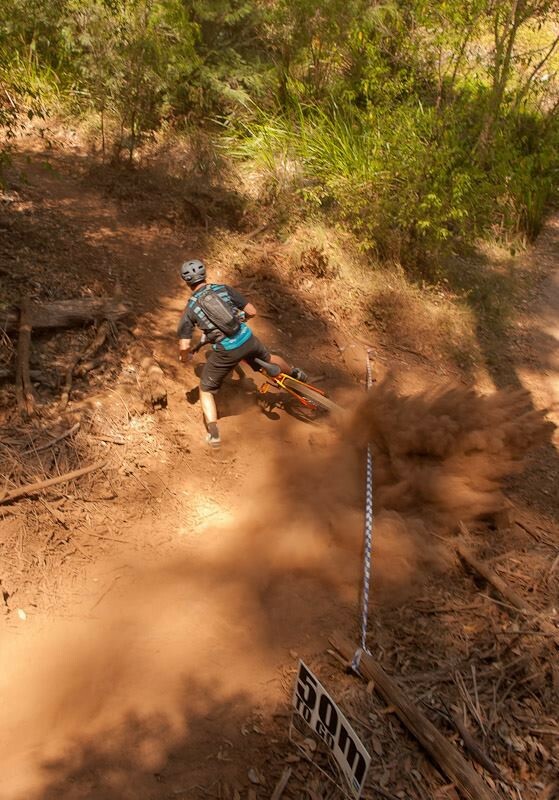 Pemberton, 15th Feb.
WA Gravity Enduro and Rock ‘n’ Roll Mountain Biking are teaming up for an epic weekend in Pemberton! 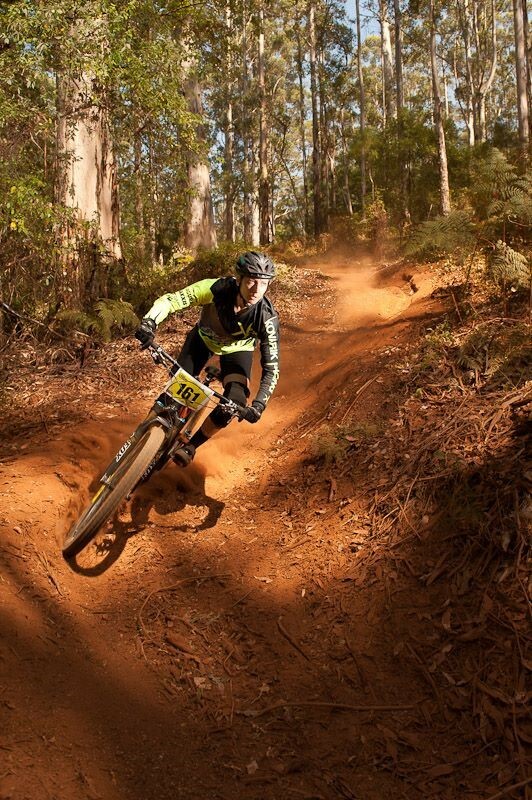 Don’t let an opportunity like this pass you by – get enduro race training by two of the best enduro riders IN THE WORLD with a 3 hours gravity riding clinic, and then put what you have learnt to the test with Round 1 of the 2015 Chain Reaction Cycles WA Gravity Enduro race in Pemberton on Sunday, 15th Feb. Places are limited for the clinic and the WAGE race. You can sign up for it all through the WA Gravity Enduro registration process, or contact Rock ‘n’ Roll Mountain Biking directly to make a booking and ask any questions.